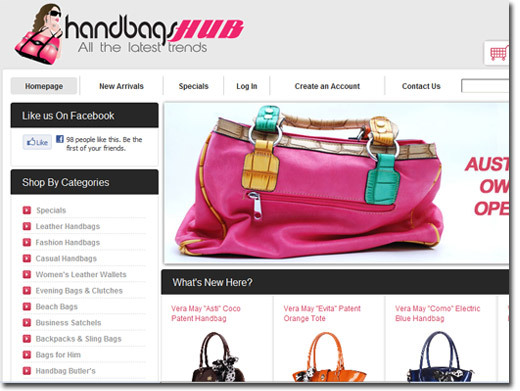 Handbags Hub is an Australian online store stocking the finest in Handbags and accessories. We have a large collection of fashion, leather, casual handbags, scarfes, wallets, luggage from all the best designers. Our stock is high quality, affordable and comes with free shipping. So if you are looking for affordable Pierre Cardin, Vera May, Manzoni, Modapelle or any other quality designer be sure to check out our range at Handbags Hub. Australian (Ulladulla) based company offering handbags and accessories for sale. Website includes e-commerce facilities, shipping and returns information, conditions of use, full company contact details.